I often make this instant version though never tried with mango, looks so sinful Harini. Enjoyed all your instant dishes, so useful for many! Looks delectable !! 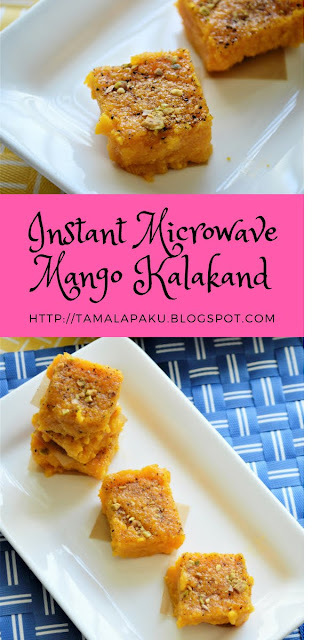 I have tried this Mango Kalakand, it tastes delicious. Yours has turned out good too ! Mango kalakand in MW sounds like a keeper recipe , will definitely give it a try . Omg! Mango kalakand! That's quite a flavorful take on regular kalakand. I know how delicious this kalakand will be, have tried long back and completely enjoyed them. Prefectly made Kalakands looks alluring. I would never have believed this was made in the microwave. I love quick and easy versions of all dishes. Liked all your choices for this series. This mango kalakand is looking so delicious. color is beautiful and texture looking grainy. Loved this recipe. I have started using my MW only recently. These instant recipes are so good in MW and it makes out job so much easier. The mango kalakand looks absolutely yum Harini..
wow.. looks so mouthwatering and moist. love it. I am in for any dish with mangoes as I am a big time fan of mangoes.